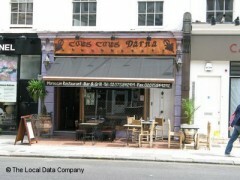 About: Cous Cous Darna is an authentic Moroccan restaurant in the heart of South Kensington, serving delicious traditional cuisine. Very rude, kept coming every min, wanting to take order!! so annoying, that we have tio leave before ordering, the place gives me the creeps, and cold. No manners, keeps arguing with the custumers! !, asking for service charge even before we order food!! Never go in again, deserves rating below Zero. I would not recommende it for an enemy! !.